I wanted to show something food-related for Halloween, but all I had were some sweets I'm saving for the hordes of children I'm expecting for trick or treat on October 31. 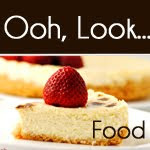 Actually, whenever I don't have anything on hand, there is always a knock on the door and 'Trick or treeeaattt!'. And whenever I'm prepared (like this year), no one turns up. Oh well,.. 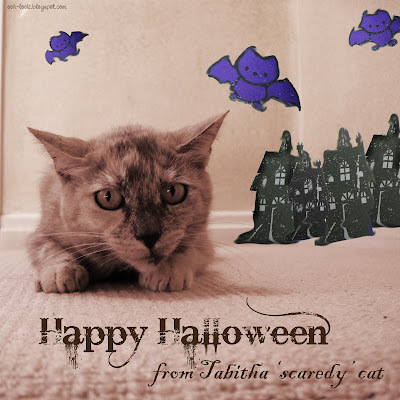 Anyway, Tabitha cat and I hope you have a candy-filled, ghoulish Halloween. oooh Tabitha looks evil, like she's just about to pounce the moment you take your eyes off her...*cue jaws music* Happy Halloween to you too! hi Chris - would you believe it, we didn't get any trick or treaters this year! Tabitha was most upset at not being able to chat to some new faces. At least I can now eat all of that chocolate I bought! i've never had anyone knock on my door for halloween actually! lol- nice to know of another food obsessed cat lover! My kitty Creamy was especially scary on Halloween as she ran out the balcony in excitement nearly jumping 10 floors!! I was about to have a heart attack! hi Betty - no one came this year - I was a bit disappointed! hi Adrian - your Creamy is absolutely adorable! And the Frenchy toast would make anyone feel good! She looks really panther-like in that photo, even if she is secretly a scaredy cat!